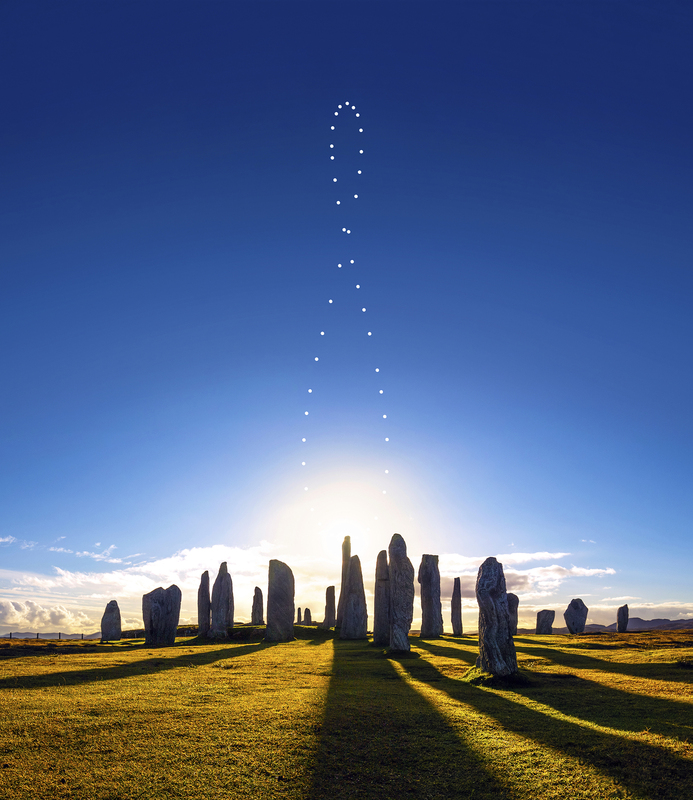 In the composition (a three-shot vertorama for the background and 42 different solar pictures) we can clearly see the analemma over the magnificent megalithic site of Callanish, almost 5000 years old! To walk amidst the monoliths placed on the ground according to a specific design, probably dedicated to the Moon and her phases almost manage to transport the traveler back in time, when the first civilizations colonized these islands on the edge of the Atlantic! An experiment that I wanted to try again, after the successful experience of last year, always fighting with the ever fast changing weather of these places. I managed, however, to photograph more images than I anticipated, creating a complete analemma, with the inferior (Winter) culmination of the Sun purposely behind the highest stone of the site. This strange figure, with a shape of an 8 or an infinite, the analemma, is caused by the axial tilt of our planet, and by the elliptical shape of our orbit around the Sun. If we take a picture day by day, always at the same hour, the Sun is not in a fixed position, but it slowly climbs up and then down the curve. All this, framed in a breathtaking ancient landscape, as old as the men and women which under the same Sun built this magnificent lunar observatory!